Remember that there are some pictures in the Duiker Magazines. Codrington 1962 - thanks to John Whittaker for this one! This photo, taken in 1954, was sent by Colin Carlin and is of Codrington in the old building just above the Railway station in Mazabuka. Botha, S. Pilsworth, A. Watson, Smit?, Afie Faurie, R. Thompson, G. Tillet, Ferdinand van Biljon, Mr Van Wyk,, Robert Lacey, P.Veltmann, Derek. Ray, Mr Perrie, Smit?, H. Lean, Colin Carlin, B. Pinaar, A. Postma. Rita? Styn, B. Venter, Mrs Pretorious, Faurie?, (half hidden), Mrs Edmonds, Marie? Styn, Betty van Vurin (Sp?) Mr Shipman (Headmaster), Pretorious, Mrs Newham (an excellent English teacher) Steyn ?, Mrs Van Wyk, J.Tillet, Mac? If you have any suggested names to add to the above let me know and I'll put them up and pass them on to Colin as other faces are familiar to him although he can't remember names. The teacher is Mr Geoff Firth. Middle row on the left is Jane Tillet and second from the right is Greer Cantlay. 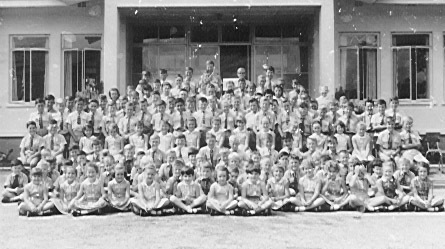 Front row, second from left is Patrick Ellison and on the far right is John Meadows.